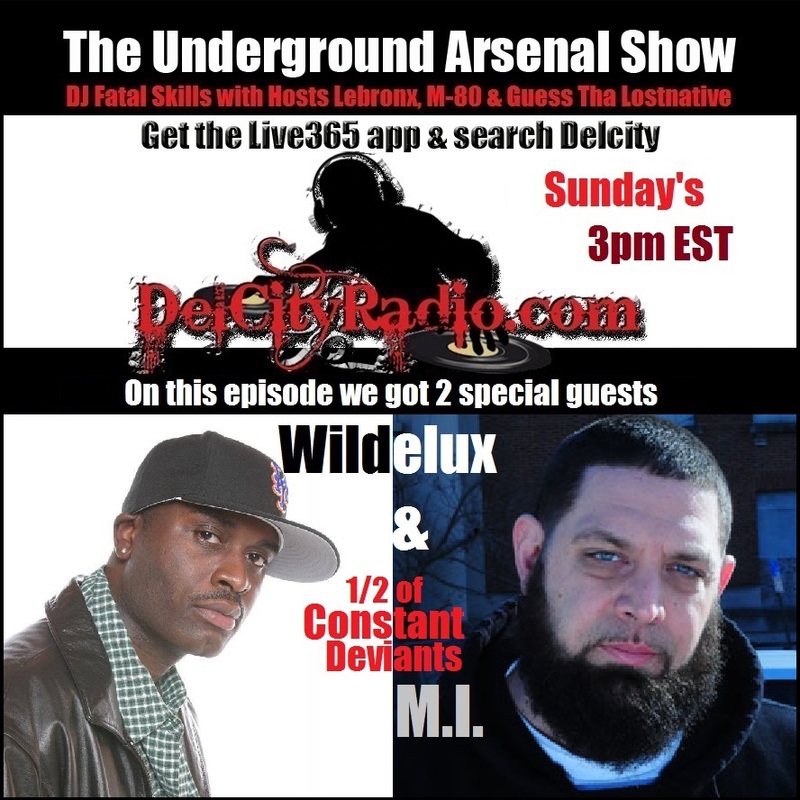 Another chance to listen back to Constant Deviants on last week’s East NY Radio show. First broadcast live on Thursday June 30th, M.I. and DJ Cutt came through to Brooklyn to chop it up with PF Cuttin and co hosts Millz Murda and DJ Anthony Mace. They discuss their new album “Omerta” which dropped June 28th and their policy of releasing on vinyl through their own Six2Six Records label, DJ Cutt gives an insight as to the production process and then M.I. delivers a killer freestyle. There’s only a little under two days to go until veteran hip hop duo Constant Deviants release their new album “Avant Garde” on Tuesday 12th May, their fourth in 6 years. It will be released on their own Six2Six Records imprint and made available on vinyl, CD and digital formats worldwide. Now based in Baltimore, Emcee M.I. will be returning to Brooklyn tomorrow where he lived for 10 years to link up with New Jersey’s producer DJ Cutt for a series of media and radio interviews in NYC this coming week, which will include live appearances on Beatminerz Radio and Not 97. It’s been an extremely busy couple of months in the lead up to release as Constant Deviants have conducted many interviews with international publications, launched their “3Stylez” video series, saw their single “Breathin” reach #1 in the college charts & feature in the UK’s DJ Magazine, released their “Swiss Banks” movie with their European partners SWC Records and released a couple of tracks previously hidden deep within their vaults. 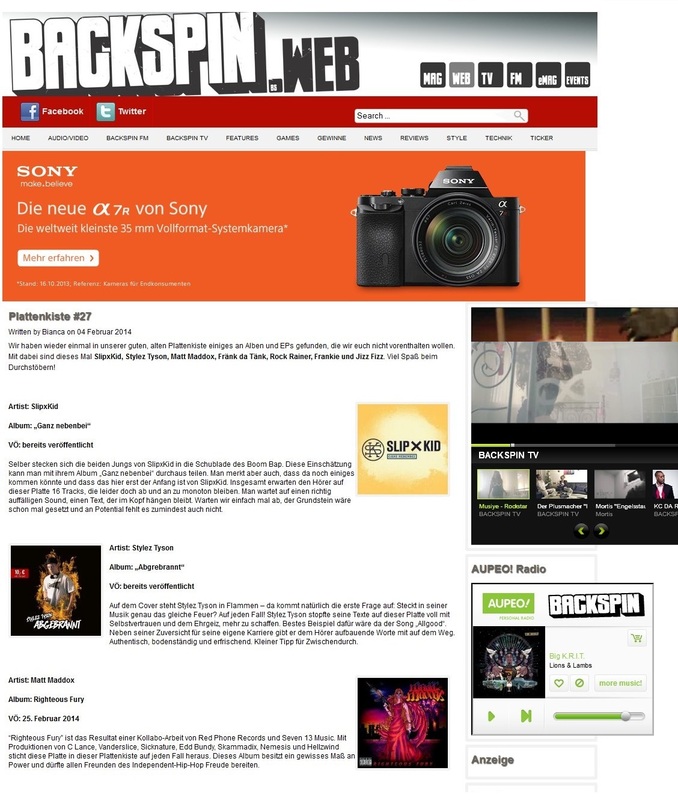 Look out for much more media coverage in the weeks ahead as well as the release the third and final video from their “3Stylez” series and a new official single taken from the album. 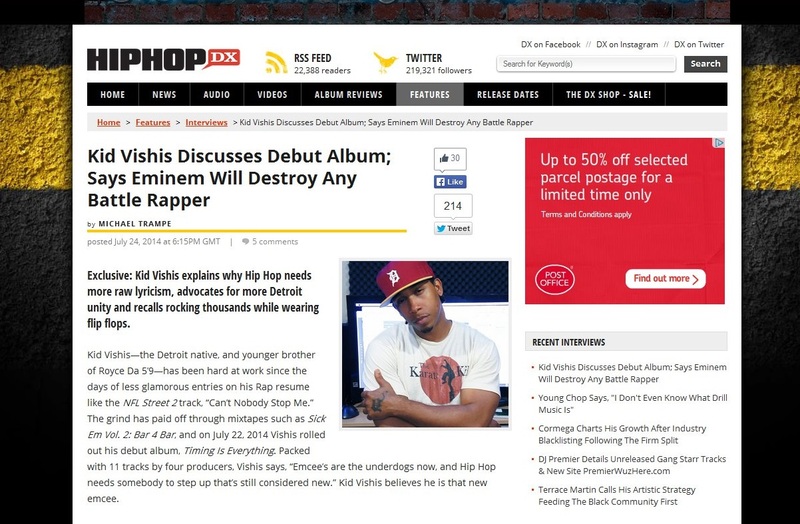 Last week, Detroit’s Kid Vishis jumped on the phone with New Jersey online Hip Hop Durso’s charismatic young writer Roberta Lampley shortly after the release of his debut album “Timing is Everything”. In what was an enthusiastic & fun exchange of views, the pair spoke about his writing process….and the key role Fiji Water, Monster Energy Drink & chicken plays in the pre-studio process!….the construction of the album and reasons for working with a core group of producers this time around, the thinking behind the album’s title and how it represents where he feels he is as an MC now. They also discussed how the influence of not only Royce da 5’9″ but all 3 of his brothers played when he started our rapping and how that came about, his views on the depiction of hip hop today and why he feels “Hip Hop lost its respect, its pride, its honor. It’s become a fashion circus.“, the producers and artists he’d like to work with and gives an insight into his plans for future releases. In the lead up to the release of his debut album “Timing is Everything” we linked up Detroit’s Kid Vishis with HipHop DX contributor Mike Trampe recently. 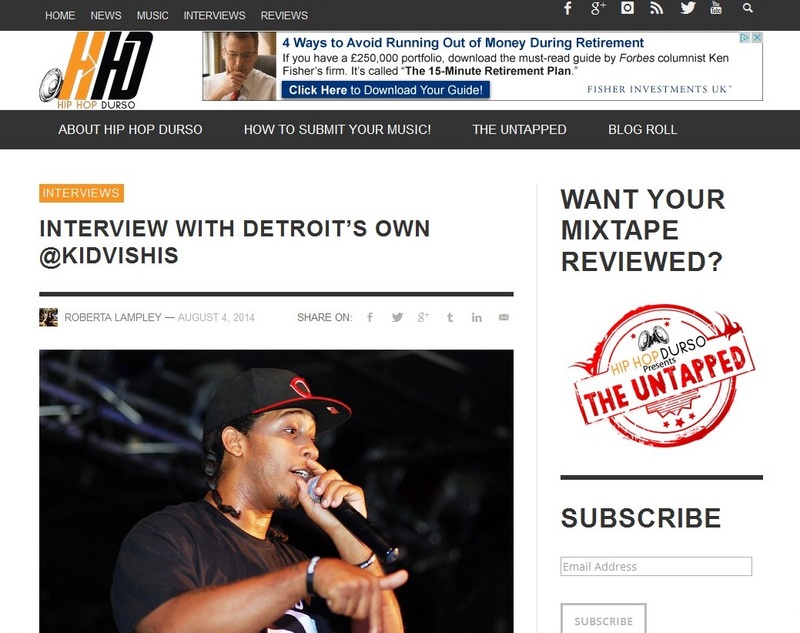 In the feature published on 24th July, they spoke about the thought process and choice of producers for the album, growing up in the Detroit scene as Eminem and D12 emerged globally and how the city has influenced him to become the artist he is today, and the experience and learning curve that touring in the UK with D12 & his brother Royce da 5’9″ in 2009 brought. They then discuss his own future plans, his thoughts on the future for Detroit’s hip hop & rap scene, and speaks on the rap battle scene and specifically the Total Slaughter event he attended in early July. 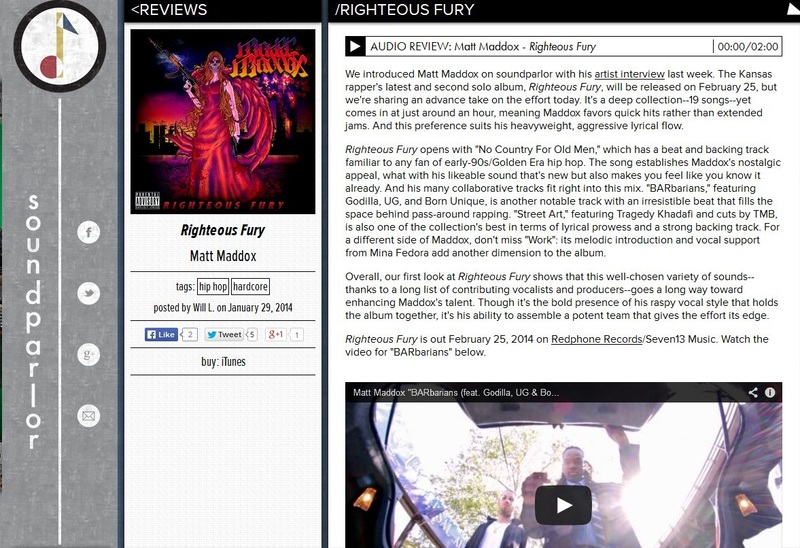 One of Germany’s premiere hip hop & rap music magazines Backspin published their regular roundup of upcoming releases, and included in it was the new album “Righteous Fury” by Long beach MC Matt Maddox, now based in Kansas.